Game of Thrones director Matt Shakman has suggested a Jon Snow and Daenerys Targaryen romance could be on the cards. Shakman, who directed the epic season seven episode four ‘The Spoils of War’, described the two characters personal pull towards one another as “undeniable”. Jon invited Daenerys to view the dragonglass caves in Dragonstone in the episode, which revealed ancient markings depicting the First Men, Children of the Forest and White Walkers. The pair seemed to share a little more than an interest in making a political alliance, though no feelings were verbally declared. Later, Jon’s advisor Davos commented that Jon found it difficult to keep his eyes off the Mother of Dragons. He added that the pair shared “subtle chemistry” and a “lot of tension”. “In the cave scene, where Jon takes Daenerys to take the cave markings, I think there is a lot of subtle chemistry happening there between the two of them, and even just Daenerys taking that tiny step forward to Jon before she asks him to bend the knee. There’s a lot of tension in that that I think comes from just two great actors in that darker, more intimate location. 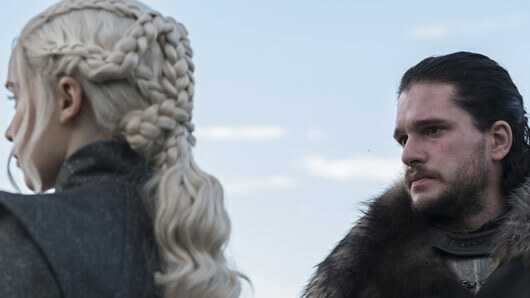 Will Jon and Daenerys fall for one another? Only time will tell. Game of Thrones continues Mondays at 2am and 9pm.